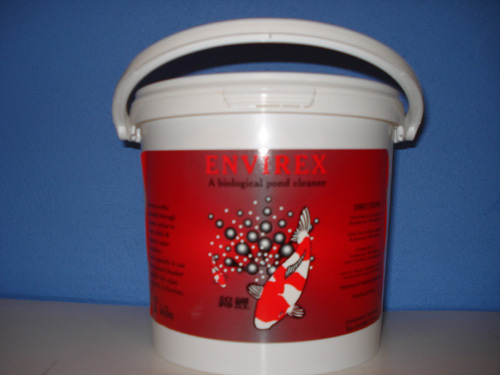 Envirex-biological pond cleaner. Also available in a 2kg tub. Envirex was created to make ponds far more hygienic and less chance of disease developing in the fish. Envirex degrades all types of solid waste matter whilst lowering ammonia, nitrite, nitrate and phosphate and other unwanted substances in pond water. The product can help to reduce the amount of filter cleaning, pond vacuuming and general maintenance. Envirex is a natural product and cannot kill blanket weed or algae like a chemical but it can inhibit its growth but this requires regular use. Assessing the dose: All benefits of Envirex are seen with regular use and this is safe as it is non chemical. Customising the dose level to suit individual ponds allows for economic control. The amount required is directly related to the volume of fish stocked and the food they consume not the gallonage and this is why the dose level can be adjusted by the user as ponds vary greatly. If the fish create more waste one week due to heavy feeding use Envirex two or three times that week and then revert to normal use the following week . Instructions for first use: Envirex should be mixed with water to a milky consistency before introduction into pond or the filter. When first using Envirex 80 grams per 1,000 gallons to a new pond or 40 grams per 1,000 gallons to a mature pond and wait a few days for settlement. Regular applications: After settlement commence weekly use. The average pond with a low stocking density needs 5 grams per 1,000 gallons every 4-7 days to control unwanted substances and solids. However overstocked ponds or those with water quality problems may need 15-20 grams per 1,000 gallons adapt to individual needs. Envirex is natural and harmless overdose is impossible. The product can be used all year round but if discontinued for winter re-seeds the pond with the first application dose again in spring. There is no need to switch off ultra violet sterilisers when using Envirex and the product does not interfere with any pond medication.